Over the river (if you can call the L.A. river an actual body of water) and up the 101, to Grandmother's house we go. I go up this year bearing two home-made dishes I hope will counter the bounty of processed foods otherwise gracing my mom's Thanksgiving table: A homemade apple pie, and Moroccan butternut squash and chick-pea soup. I know the soup, at least, will turn out. Probably. It's my favorite soup, creamy and flavorful, with a chestnutty taste of chick-peas and just a hint of Moroccan spices. It's so loaded with beta-carotene and vitamin A, you can feel OK about all that smoking and drinking you're going to be pressured into at Grandma's house this year. This recipe for Moroccan butternut squash and chick-pea soup has been a favorite of mine for years, ever since discovering Kitty Morse's Vegetarian Table: North Africa (which features photographs I want to lick off the page). Morse calls it soupe aux pois chiches et au potiron. I call it my no-fail Thanksgiving soup. Here it is. I've ever so slightly adapted. 12 fresh cilantro sprigs, minced. Preheat oven to 375. Cut the squash in two and scrape out any seeds or pulp. I use butternut squash in this recipe, so I like to add butter and brown sugar into the hollow before baking. Place squash in an ovenproof dish and cover tightly with Tinfoil. Bake until tender, about 50 minutes to an hour. Let cool for a bit, then put the pulp in a bowl, and set aside. Meanwhile, in a large saucepan over medium-heat, saute the onion until tender, about 6-8 minutes. In a blender or food processor, puree the squash, onion, broth, reserved liquid from the chick-peas and half of the chick-peas themselves. Do this is batches if necessary. Return this puree to the pan and gently stir in, under low to medium heat, the tomato paste, salt, pepper and cayenne. Heat the soup through and add the rest of the whole garbanzo beans. Sprinkle with minced cilantro before serving. I like to grate a little fresh nutmeg in there as well. Everybody loves this soup. And if you serve it in a beautiful Moroccan style bowl, they'll love it even more. The hardest part of this recipe? Cutting the dang squash in two. It's always a death-defying moment, with five or more of my nimble appendages hanging in the balance. So far I've managed to cut a dozen butternut squashes and live to count all my fingers. But who knows about this year? Stay tuned. Instead of trying to cut them lengthwise first, the squash in the photo I peel first, then cut into three pieces, flip the flat side down on the counter, then cut them in half, then half again. Faster, easier, and safer too! Telaysin – do you microwave it before, like Reeni (comment above) to soften the skin before peeling? 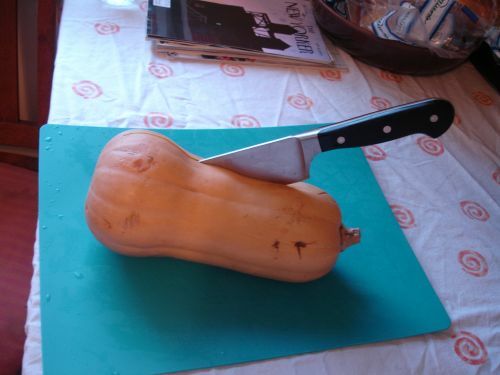 Otherwise, I don’t see how you could easily skin a butternut squash. But I love your suggestion and Reeni’s! See how much I learn here?